It has been a while since I have done a big project, which is sad because I am a project addict. But I’m back in my groove and I’m loving it! So, about two weeks ago I saw an ad on craigslist for free pallets, and I got to thinking ” I bet I could make something out of pallets”. When I brought it up with Brynt, he told me to “please, please please make new night stands for us!”. So I scoured Pinterest for ideas, there were a few pallet night stands out there but nothing that I really liked. So I decided to wing it, which is pretty much how I do everything. Before I get started on how I did it I would just like to add this little tid bit that I feel is left out of all the other DYI pallet posts on the internet; the hardest part by far of this whole project was getting the stinking boards off the freaking pallet! Holy cow, what a pain, but totally worth it. Ok, you have been warned. 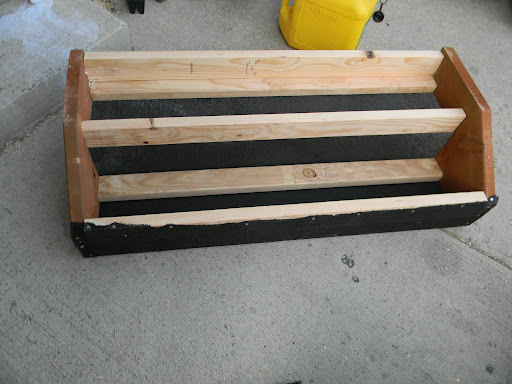 I started by making a box and then nailing boards to it vertically. Again, I really didn’t have a step by step plan, I just had an idea of what I wanted to do. This continued and my hubby helped me by putting one of the shelf supports in the bottom which gave it more stability and thus made putting the rest of the board in easier. The next step ( I thought) was to add the rest of the shelf supports. So I did that, and guess what? It was REALLY hard to get the top measure the same width as the bottom. Granted, had there been an extra person or two to push the top to the right width while I nailed the boards on, I think I could have managed it. But alas, I work alone. So then my husband came to my rescue once again. “If we take the shelf supports out and nail the top on at the correct width, it should make things a lot easier”. He is so smart. Next I added the remainder of the small boards I used to keep the shelves in place to the front to make it look a little more finished. 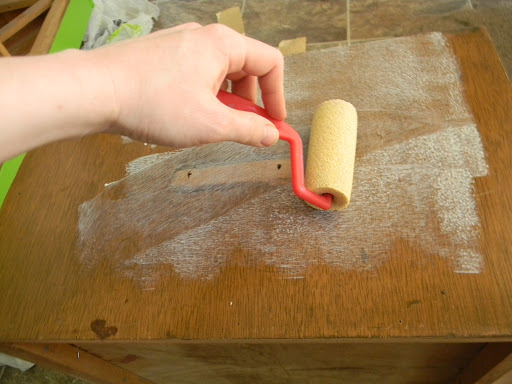 Finally I had reached my favorite part of almost any project: sanding and painting. 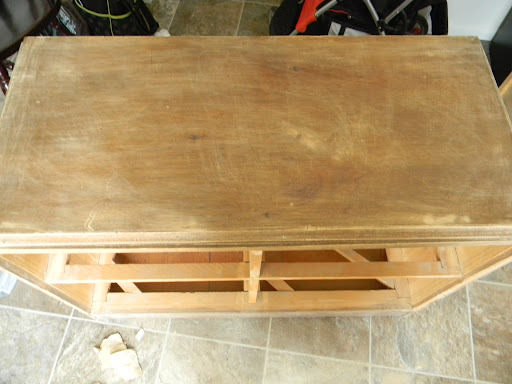 I chose to not sand it to much because I wanted more of a rustic look, I also knew I wanted to do a white wash on it so I left it a little on the rough side so it would soak up more of the wash. This was my first time white washing something and I learned a few things. At first when I put it on I thought ” oh no, its way to white!”, but I quickly learned that it soaks in really fast and I actually ended up doing about 3 coats of white wash to achieve the look I was going for. Ta Da! I absolutely love how it turned out. And I can’t wait to get started making its twin! I love re-purposing things. Not just a little bit, I really love it. There is something incredibly satisfying about taking something old and forgotten and giving it a new home. Well this weekend I did my my finest re-purposing work yet. I should start by saying that recently we got a new flat panel TV, it is replasing the tv that Brynt’s parents gave us when we first got married, which was a GREAT tv (seriously, so thankful for awesome inlaws who happy gave us their old tv), but it was a bit bulky. Or a lot bulky. So we got a new tv on black friday ( smokin’ good deal), and is SO much less bulky! I know that Brynt is loving it because it is big and cool, and I do too, but mostly I like it because it is flat. Anyways, because we got this new tv, I really wanted a new tv stand as well. The bulky tv had been sitting on an old coffee table who, like the tv which it served, was quite bulky. Not Cool. So I scoured the online for sale ads until I came across the perfect dresser to convert to an entertainment center. She didn’t look like much to start with, but I had a vision and I knew I could turn that dresser into something great. And I did. This is it before, your average, run of the mill dresser. So I have been on a sewing streak lately, and yesterday I made this little number for Camberlyn. So Brynt and I love projects. making stuff, remaking stuff, its our thing. 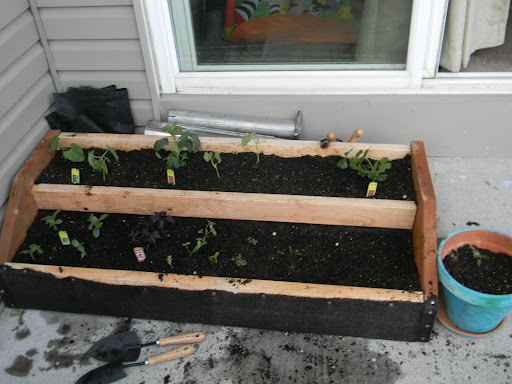 Today we built a garden box for the back step, and its awesome. We live in a townhouse/apartment so we don’t really have a yard that is “ours”, its more like everyone’s yard. But I really wanted to do a little garden this summer. Solution? This little guy. This was honestly really easy. The side pieces are pre-made stairs that you can get at Lowes or Home Depot that we flipped over. We used 2×4’s for the middle sections, it took five 8ft boards cut in half: two in the back of the top tier, two in the front of the bottom tier, one in the back of the bottom tier (laid flat ) and one in the front of the top tier (up right). We then covered the bottom of the box with screen door fabric… And that is it. Simple. Then it was on to the fun part of filling it with dirt and planting! Yay! Here is the finished product. Fits great on the back step and saves lots of room. I am a happy girl. 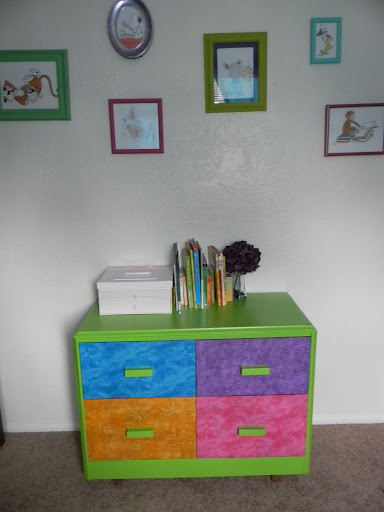 I have been wanting to get a dresser for the baby’s room for a while now, but I just couldn’t find one that was the right dimensions for her room. Then I came across this little guy at a thrift store the other day. It wasn’t exactly a beauty to start with but I saw potential. So, First step : Sand it down. Just enough to get the finish off so the paint will stick. Next : Paint! 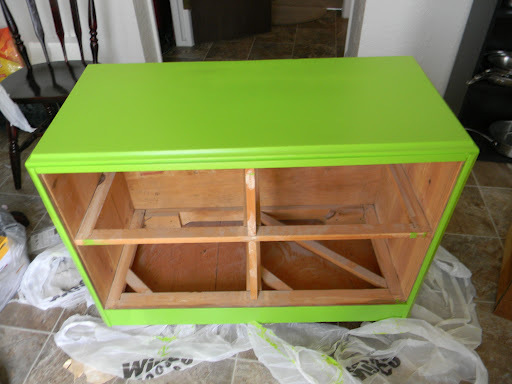 Brynt is the one who chose this wild green, but the rest her furniture is very colorful as well so it works. It took about 3 coats for it to really be covered. For the drawers I had decided that I wanted to cover them in different colored fabrics. 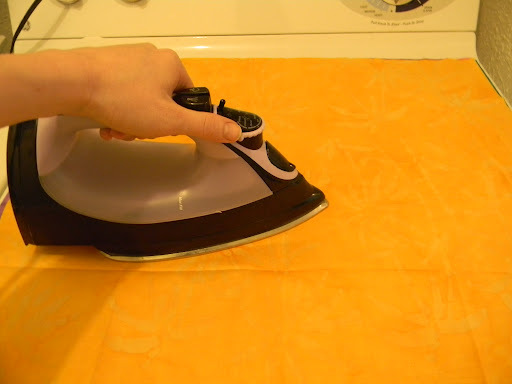 I found squares of fabric at the store meant for quilting that worked great. I made sure to Iron them first. 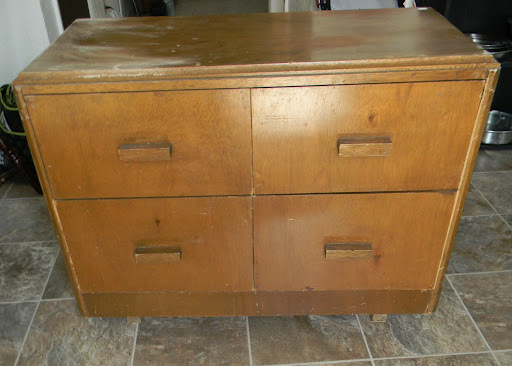 Then I removed the handles and applied Mod Podge to the drawer face. 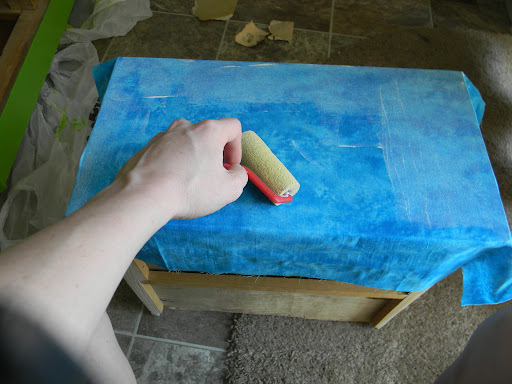 I then smoothed out the fabric onto the drawer, and covered with more Mod Podge. To finish it off I trimmed the excess fabric, painted and re-atatched the handles and it was ready to go!